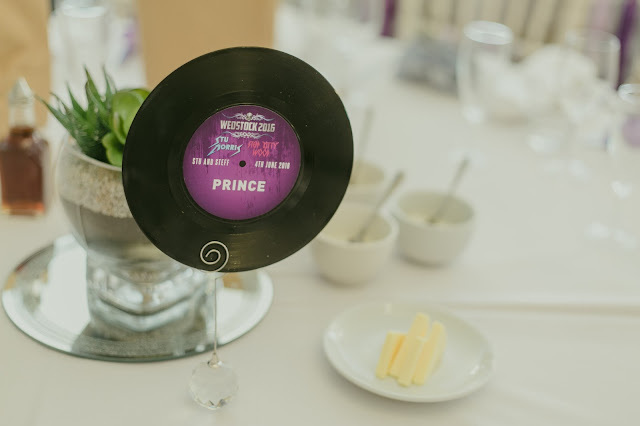 One of the key themes of our wedding, right from the invites to the day itself, was music. It's a huge part of our lives and helped bring us together, so it was important for our music and day to reflect us. When we first began planning our wedding the invites were the first thing we looked at, and they set the tone for the whole day. It's the first part of your day that your guests get to see, and it hints at colours and themes and even how formal the day would be. 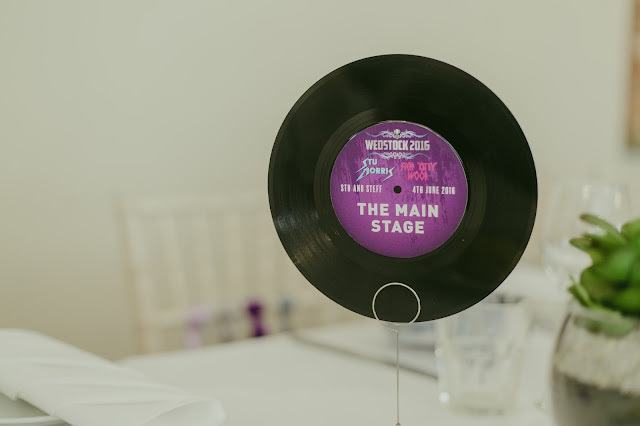 When we discovered WedFest, we knew we were onto a winner. They offer festival style invites, stationary, wristbands and so much more, all designed for weddings, or any other event you could imagine. 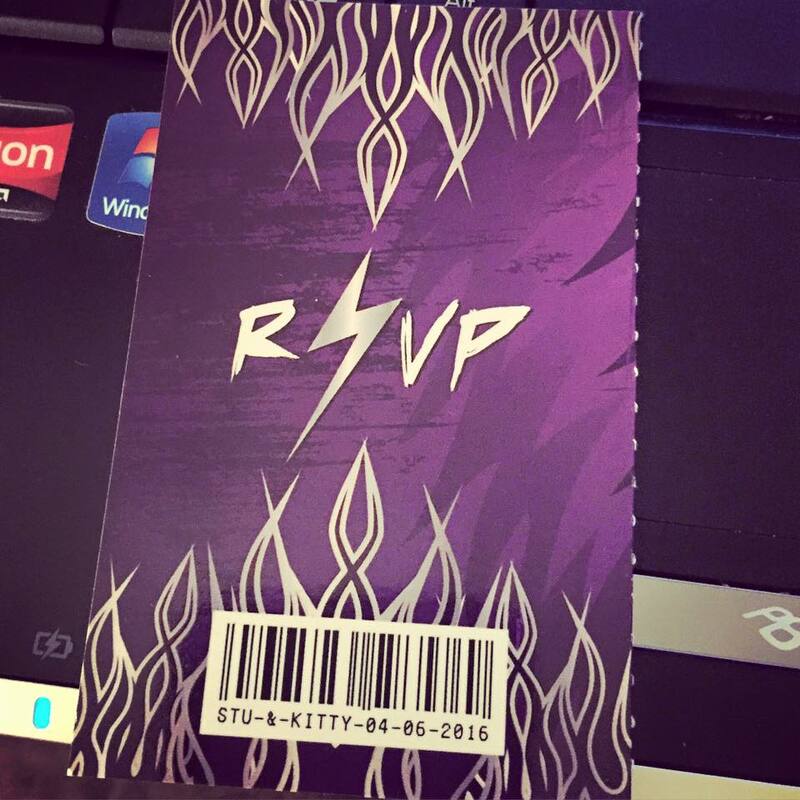 We knew we were having purple as our main colour theme, so it was an easy choice for our invites. We both prefer silver as a metal so knew that would feature too. 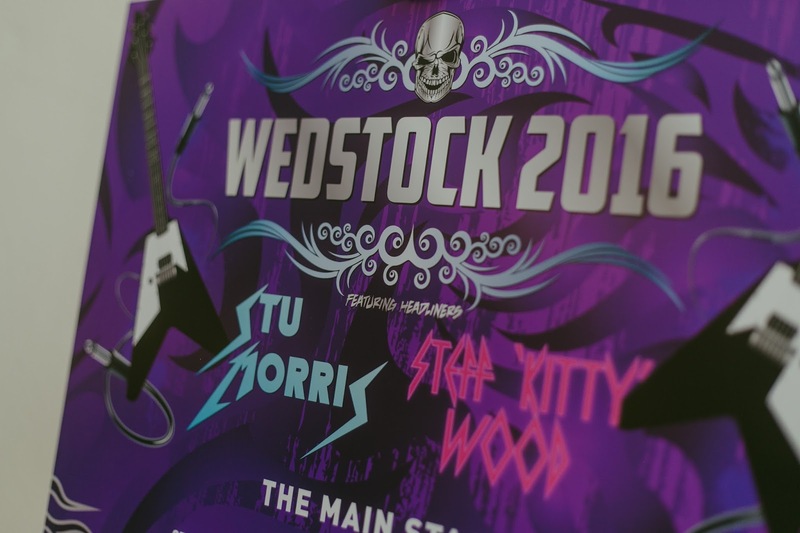 We had a good look through WedFest's previous work and loved the flame and heavy metal styles. They have a huge variety of different styles so have a good look! 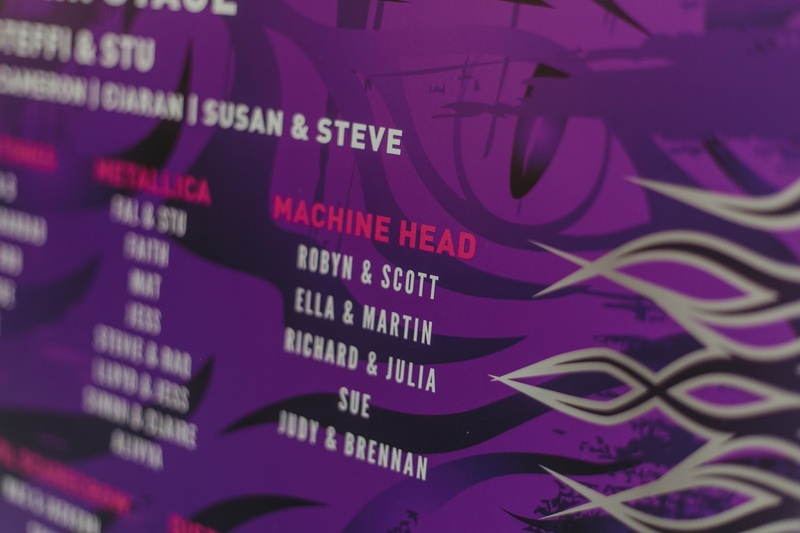 The attention to detail on the invites was fab, Stu had his name written in the Metallica font (his favourite band) and the invite was like a gig ticket. 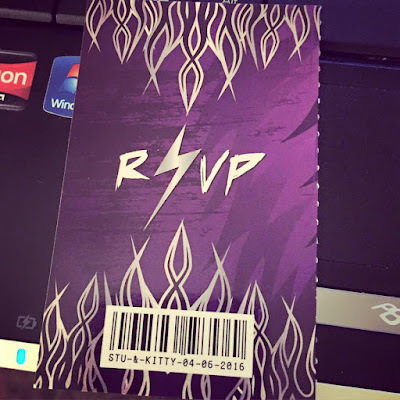 You tore off the stub to send back to us with your RSVP. The barcode on it was my favourite part, with our names and the date of the wedding on it. The advantage of using WedFest for our invites, was that we were able to carry the artwork on the invites into the stationary on the actual day. We commissioned our table plan and the table name stickers to use the same artwork style and fonts. 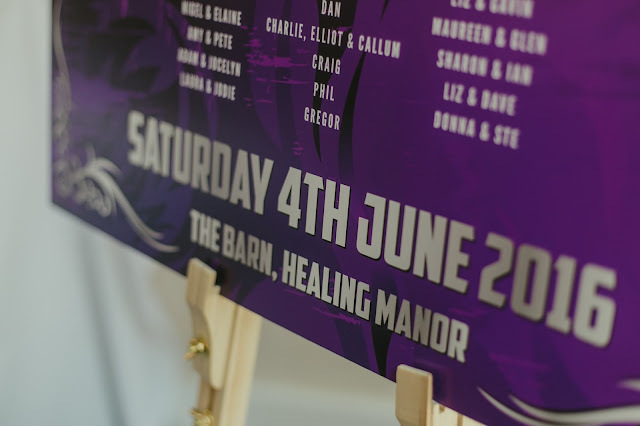 We love the table plan so much we plan to put it up in the house somewhere! It's a really thick material that means it stands up independently, so all we needed to do was pop it on an easel and it stood up no problem. We called our day WedStock because it sounds a bit more 'metal' than Fest. We carried on the music and festival theme and named each table after one of our favourite bands. We picked some together, and a couple each, trying to keep them appropriate for the people on each table. For example, Stu's daughter Robyn was really into Machine Head as a kid, so her table was the Machine Head table. All the detail in the artwork was so cool, the different shades and tones, the swirls, it has so much attention to detail. 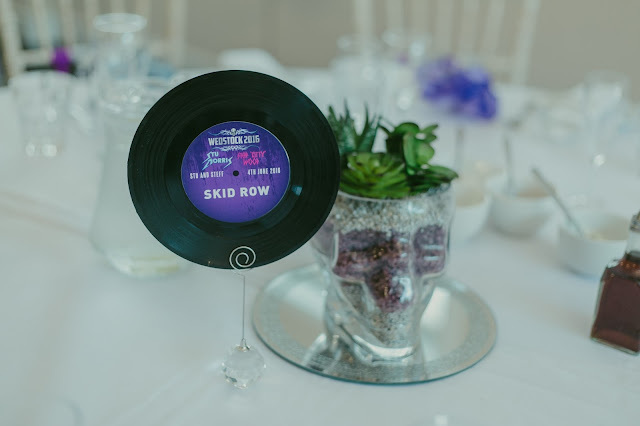 We decided we wanted to use records as centre pieces and to share the table names, so bought a bunch of 7 inch vinyl off ebay cheap, and after checking we hadn't accidentally bought a real bargain, we ordered stickers for the vinyls from WedFest too. 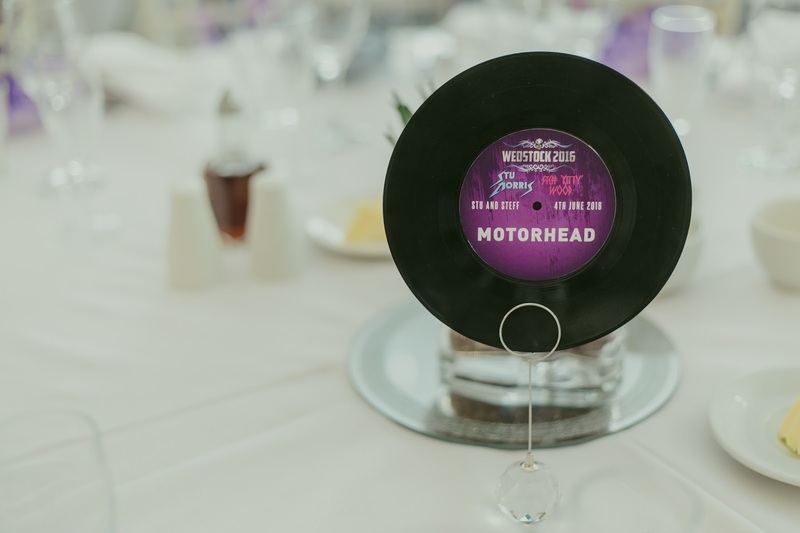 Some of the bands and artists we picked were easy choices, Prince and Motorhead had to be part of our day after losing Lemmy and Prince this year. True artists we both admire. Others were less easy! 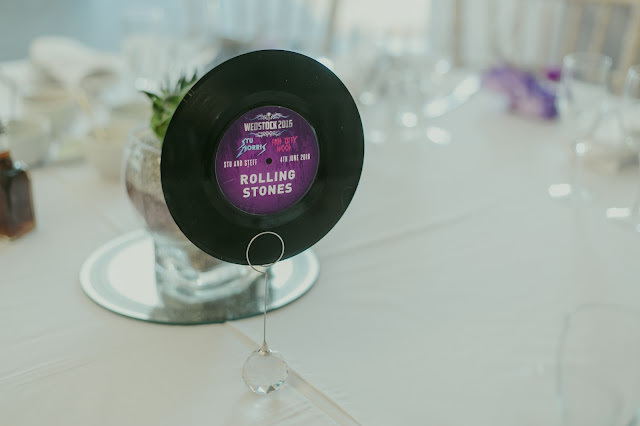 We picked out the Rolling Stones for my Grandparent's, because my Grandad has a tendancy to sing Ruby Tuesday whenever he is in a good mood! 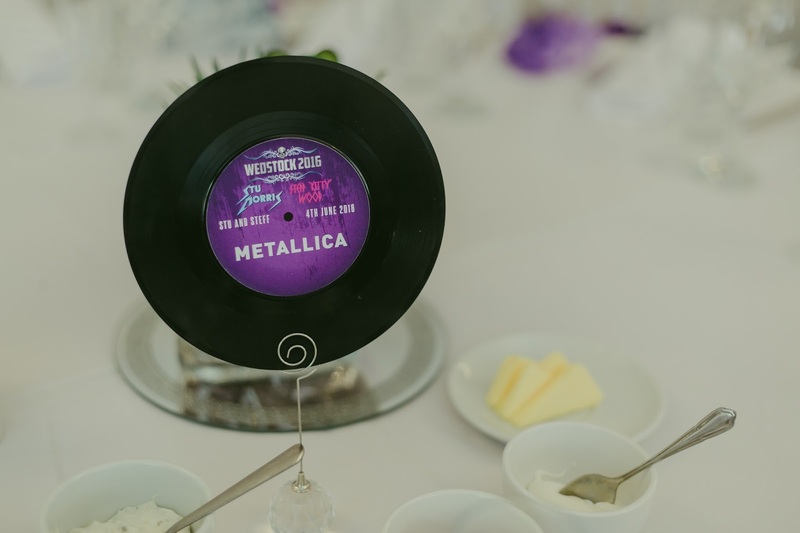 Metallica, Stu's favourite band, is where we sat our bridesmaids and groomsmen, we also had the Black Sabbath table for my Welsh family as we have several secret metal heads who are Sabbath fans. 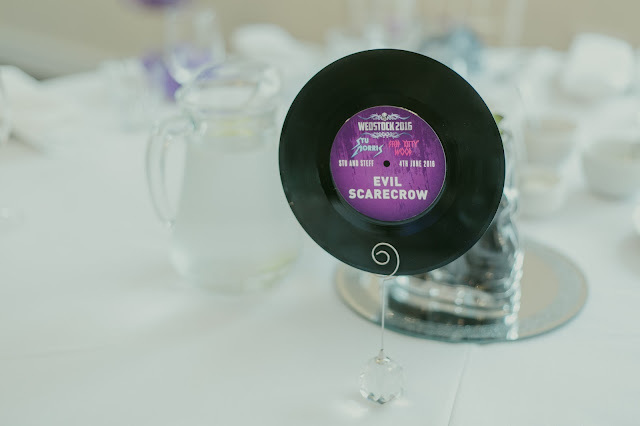 We know Evil Scarecrow personally, so couldn't resist naming a table after them! Several of our friends are also Scarecrow fans so they sat at that table. 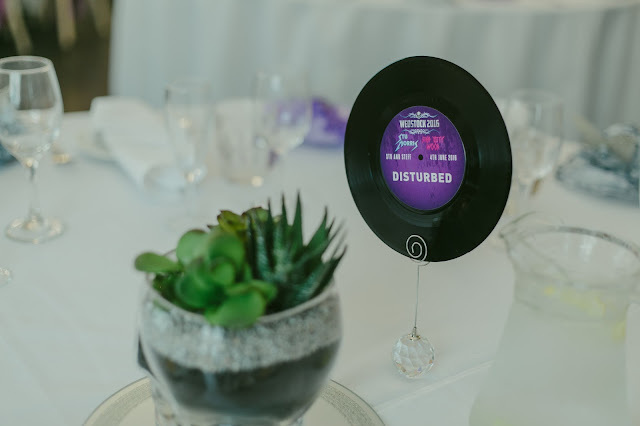 Some of our best friends sat at the Disturbed table... a cheeky play on words as well as a band Stu loves! Skid Row are my favourite band, and the band that brought us together. When we met I had no idea who they were, but when Stu invited me to see a Skid Row tribute if I was into them, I said yes and lied... oops. I went home and googled them and thankfully they turned out to be hair metal magic and I adore them. I fessed up two years later! 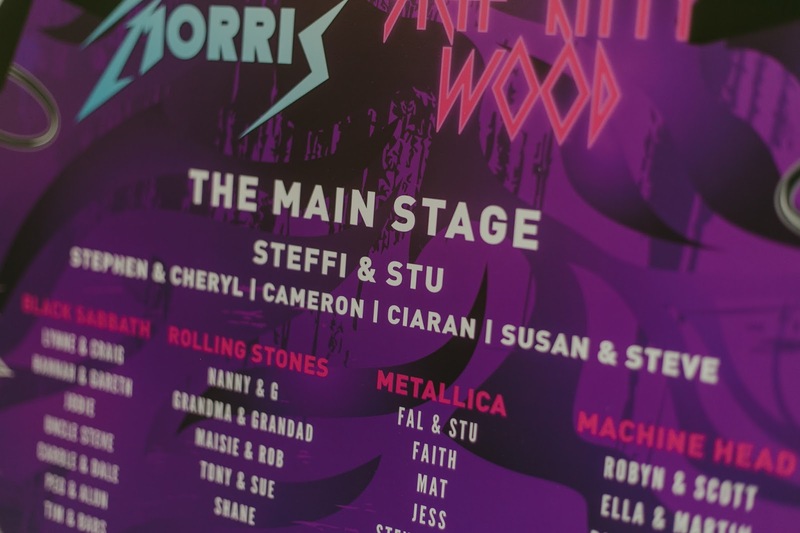 The top table was the Main Stage, we couldn't pick a band for us so decided we were the headliners instead. The stickers were incredibly easy to apply, which was a real relief! You can buy them pre-made on the records, but I hadn't realised that at the time. WedFest were fantastic to deal with, and provided such gorgeous stationary, I can't recommend them enough! All photography by ClickClickBang, save for that first phone photo by me! This is so rad and such awesome, personal detailing. I particularly love the record place holders. Those record place holders are so cool. I think it's pretty awesome and the photos are ace as well! The record holders are so cute. Never seen that before. I love everything about your wedding. So so cool! Those record table namecards are epic!! !